Selected for the American Library Association's 2019 Rainbow List. A reclamation of the Mexican serenata tradition, follow the story of a young boy who asks his father if there is a song for a boy who loves a boy. Como reapropiaci n de la serenata Mexicana, Cuando Amamos Cantamos cuenta la historia de un ni o que le pide a su padre que canten una canci n para un ni o que ama a otro ni o. When We Love Someone We Sing to Them reframes a treasured cultural tradition to include LGBTQ experience. 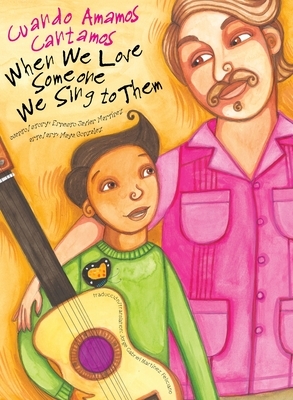 In this book, we learn about the Mexican tradition of singing to family and loved ones through one boy who naturally assumes the tradition includes him and his experience. Watch a tradition expand as limitations are lifted to include everyone, all the way to remembering Xochipilli, the Mesoamerican deity of creativity, song, and dance. A perfect book to bring tradition and inclusion into the conversation and support our LGBTQ young ones in knowing that they belong and always have, while providing pride in both our Mexican heritage and our LGBTQ culture and history as families. About the Illustrator: Maya Gonzalez is an award-winning children's book illustrator and author. She has illustrated more than 30 children's books many of which she also wrote. Her books have been recognized by the Pura Belpr award, Am ricas Book Award, and International Latino Book Awards. She is the co-founder of Reflection Press. As part of the Press' mission to uplift new voices, she served as mentor for the writing of this book.